It’s practically inevitable for duplicate contact information to appear on an iPhone or iPad over the course of using an iOS device, whether by accident, typos, through sharing vcard information with others, or from something as basic as contacts changing their names and addresses, for which another entry may be added. 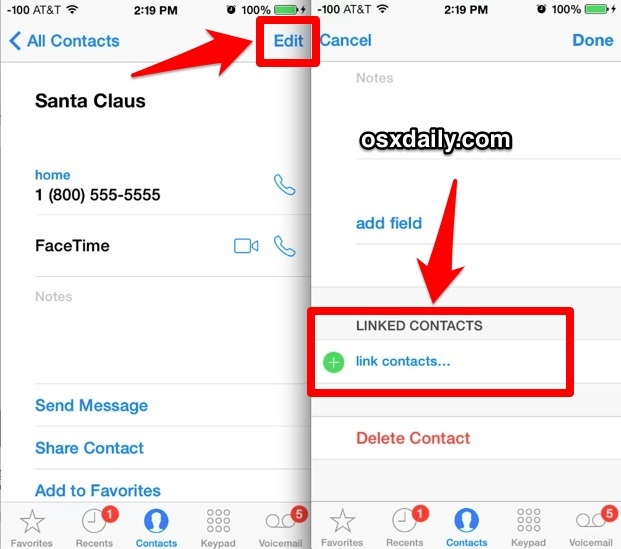 For quite some time, there was no simple way of handling these duplicate (or triplicate) contact entries directly on the device, but that has finally changed with iOS 7, and now there is an easy way to merge those contacts directly on the iPhone. Because this is done entirely on the iOS device, there is no longer any need to have to sync back to iCloud, iTunes, or a computer for the change to take effect, instead you make the change once directly on the iPhone, and thanks to iCloud, it will propagate automatically to other iOS and OS X devices that use the same Apple ID. This instantly merges all contact details from the two (or more) contact cards into a single contact entry – it does not overwrite phone number, address, or email information, it simply merges all details into a single card. Once you choose “Done”, there will only be a single contact for the details you merged (linked), in this example it’s “Santa Claus”. 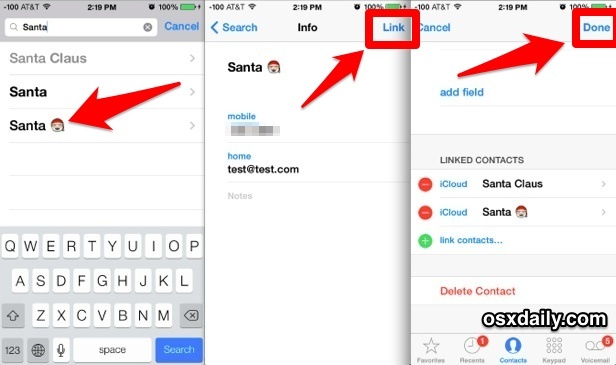 The unique thing about the “Link Contacts” method is that although it merges the contacts from the user perspective, it can be easily be undone if you decide to unmerge/unlink the contact details. To do that, just go back to the contact in question, tap on “Edit” and then tap on the red (-) icon along the linked contacts details. There are other ways to do this which may prove easier for some iPhone users, like those who have their device synced to a Mac and would prefer to manage the details from a computer, or for users who aren’t running the newest versions of iOS and thus don’t have the Link/Merge option at all. Two such alternate methods that can work in these circumstances are merging addresses from OS X and then syncing the address book back to the iPhone, or merging & removing duplicates with the Contacts app from Mac OS X and relying on the iCloud sync feature to carry the changed address information over to the iPhone. This IS NOT a merge as the article clearly (but not so clearly) states. This is a LINKED CONTACT which to me is an infuriating “feature”. I am So looking forward to the tip on how to quickly and easily merge Notes that live on my iPhone, with Notes in my iCloud account. I have since, set the iCloud account on my iPhone as the default Notes (to be written) but there are a few hundred notes that originated And live, on my iPhone. I LOVE this site for all the tips. It does NOT eliminate duplicate contacts. It will not merge, only link. You will still have multiple contacts, only they are now connected. The contacts DO merge. One needs to exit Contacts for it to take effect. I did not know about this feature until my mom called and it said her old work was calling!!!! I thought that just having set up Yahoo contacts to synchronize it was merging and not Syncing correctly!!!! a week later i finally figured it out, now I have to go through all (251) of my contacts one by one and unlink duplicates. Hi…sorry for my tech ignorance, but how do I unlink all my contacts at once? I don’t want to scroll through 600 plus entries to see which are linked. Also, what does linking entitle the person linked to? Can they see everything on my cloud drive? I ask because I sent a holiday text to my friend today and got a reply from her bf thanking me for the holiday cheer, and I never text him. His response indicated he got the text I sent her? her contact said her phone number, cloud and email were all linked. Is that how he got her text? This is a terrible idea. I regret ever doing it and have started to undo the damage. The person who invented the feature should be shipped to Chernobyl. Here’s the problem: when you have 2 contacts that you decide to merge, the separate names show up on icloud and on your mac, but not on your iPhone. If you want to call one of them, you have 50% chance of having him/her in your contacts database. Also, if one of them calls or texts you, the caller ID will show only one of the names, not the person calling. I wish there a way to identify all contacts on your desktop computer that have been merged/linked. Like others have pointed out, it is not a merge only a link, that is the info from two or more contacts are shown in a single contact. But if you scroll down to the link info and choose one of the so called merged contacts, the delete it you will see that that information is no longer showing in the consolidated presentation. That proves the contacts are not merged only linked. Of course it’s a terrible idea. This article was a terrible idea. You can’t merge duplicate contacts on an iPhone! You will need to do that on a Mac. It’s for when you’re dealing with a group or company and have several of their employees saved in your address book, you can link their respective vCards with the company’s in order to only have to open one main group while still being able to see all *linked* members with a single click on one page. 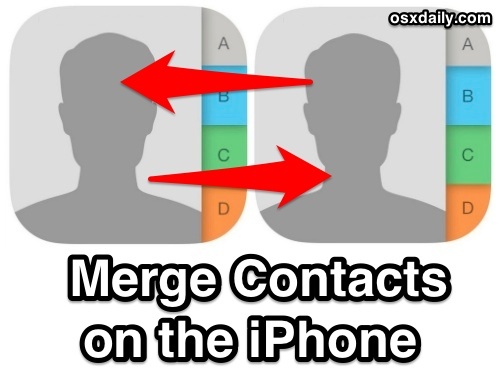 You can merge contacts on the iPhone by linking them together. 2 contacts become linked as 1 contact, merging the contacts together. Your comment is a terrible idea. Good job! Simple, Straight abd Easy to understand. Thank You dear. This post was helpful to me. And Easy to understand. No complexcity at all..
Lame. I could merge all duplicate contacts with one push of a button on my Samsung Galaxy. To accomplish the same thing on an iPhone will probably take me an hour. WARNING; This does NOT merge the information. I tried this for two contacts and then deleted the contact with less info. All the info that had been on THAT contact disappeared from the other linked contact. So the info has NOT merged at all. It is only being mirrored. So if you remove one of the duplicates you lose any unique information that was on that card. TOTALLY STUPID.